In many magical traditions, weather magic is a popular focus of workings. The term “weather magic” can be used to mean anything from divination and forecasting to actual control of the weather itself. When you consider that many of today’s folk magic customs are rooted in our agricultural past, it makes sense that an ability to foretell or change weather patterns might be considered a valuable skill. After all, if your family’s livelihood and life depended on the success of your crops, weather magic would be a handy thing to know. Dowsing is the ability to find a water source in a previously unknown area via divination. In many parts of Europe professional dowsers were hired to locate new places to dig wells. This was typically done with the use of a forked stick, or sometimes a copper rod. The stick was held out in front of the dowser, who walked around until the stick or rod began to vibrate. The vibrations signaled the presence of water beneath the ground, and this was where villagers would dig their new well. During the Middle Ages this was a popular technique for locating new springs to use as wells, but it later became associated with negative sorcery. By the seventeenth century, most dowsing had been outlawed because of its connection to the devil. In many rural and agricultural societies, fertility rituals were conducted to ensure a strong and healthy harvest. For instance, the use of the Maypole during the Beltane season often tied in to the fertility of the fields. In other cases, farmers used divination to determine whether the grain season would be successful – a few kernels of corn placed on a hot iron would pop and jump around. The behavior of the hot kernels indicated whether or not the price of grain would go up or down in the fall. How often have you heard the phrase, “Red sky at night, sailors’ delight, red sky in the morning, sailors take warning?” This saying actually originates in the Bible, in the book of Matthew: "He answered and said unto them, When it is evening, they say there will be fair weather for the sky is red. And in the morning, there will be foul weather today, for the sky is red and lowring." While there is a scientific explanation for the accuracy of this expression – relating to weather patterns, dust particles in the atmosphere, and how they move across the sky – our ancestors simply knew that if the sky looked angry in the early hours of the day, they were probably in for inclement weather. In the northern hemisphere, the celebration of Imbolc, or Candlemas, coincides with Groundhog Day. While the notion of holding a fat rodent up to see if he projects a shadow seems quirky and campy, it’s actually something similar to weather predictions done centuries ago in Europe. In England, there's an old folk tradition that if the weather is fine and clear on Candlemas, then cold and stormy weather will reign for the remaining weeks of winter. Scotland's Highlanders had a tradition of pounding the ground with a stick until the serpent emerged. The snake's behavior gave them a good idea of how much frost was left in the season. Some weather prediction folklore related to animals. In Appalachia, there’s a legend that if the cows are laying down in their fields, it means rain is on the way, although this may well be something that mountain folks tell outsiders – most cows seek shelter under trees or in a barn when bad weather comes. However, there are also stories that if a rooster crows in the middle of the night, it is foretelling rain the next day, and that if dogs begin running in circles, poor weather is coming. It is also said that if birds build their nests closer to the ground than usual, a hard winter is on its way. Can You Control the Weather? 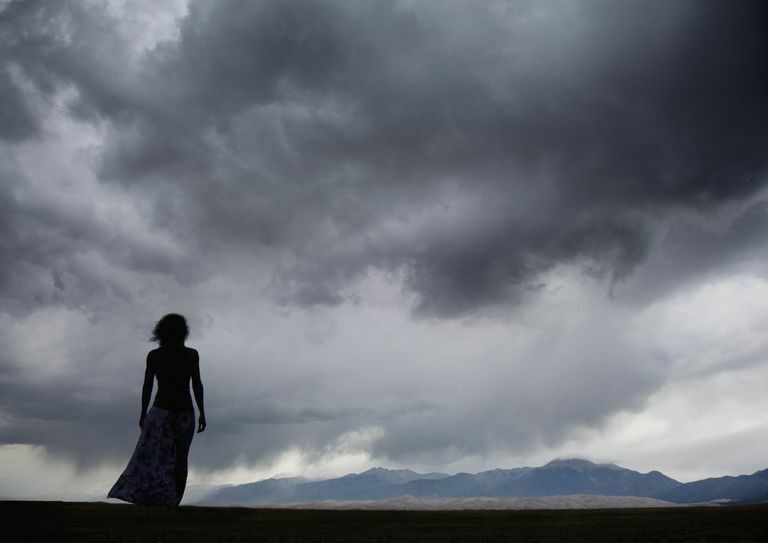 The term “weather magic” is one that is met with a variety of reactions in the Pagan community. The very notion that a single practitioner could generate enough magical power to control such a powerful force as the weather is one that should be met with a degree of skepticism. Weather is created by a complex combination of forces all working in tandem together, and it’s unlikely that you’re going to bump into someone who has the skill, the focus, and the knowledge to actually control anything as vast as weather patterns. This is not to say that weather control magic is impossible – it certainly could be, and the more people involved in it, the more likely the chances of success. It is indeed a complex process, and one unlikely to be carried out by an inexperienced and unfocused solo practitioner. However, it is often possible to influence existing weather systems, particularly if you’re looking at a short-term need that has to be met. After all, how many of us remember doing some sort of “snow day” ritual the night before a big test, in hopes that school would be cancelled? While it’s unlikely to work in May in Texas, you’ve got a reasonably good chance of success in, say, February in Illinois. In the book Nebraska Folklore, author Louise Pound describes the efforts of early homesteaders to make it rain on their fields – particularly since they knew that the local Native American tribes had rituals that were credited with controlling weather. In the nineteenth century, large groups of settlers often stopped what they were doing at a designated time so they could embark on a mass prayer for rainfall. There is a legend in northern Europe of magicians who were able to harness the wind. The wind was imprisoned in a magical bag with intricate knots, and could then be unleashed to cause devastation to one’s enemies. Snow days in particular are one of the most popular targets of weather folk magic. Spoons under your pillow, pajamas worn inside out, ice cubes in the toilet bowl, and plastic bags over the socks are just a few of the legends that school children have used for years in hopes of finding the white stuff blanketing their neighborhoods. In many magical traditions and modern Pagan paths, if one wishes to have good weather for an outdoor ritual or special occasion, a petition and offering can be made to the gods of that tradition. If they see fit, they may just grant you a bright sunny day to suit your needs! What's in a Magical Name for Pagans? Planning a Seance? Here's What You Should Know! Celebrate women's wisdom with a croning ceremony!